The 19th Annual Grateful Gobbler 5K Walk/Run will take place once again on Thanksgiving morning. 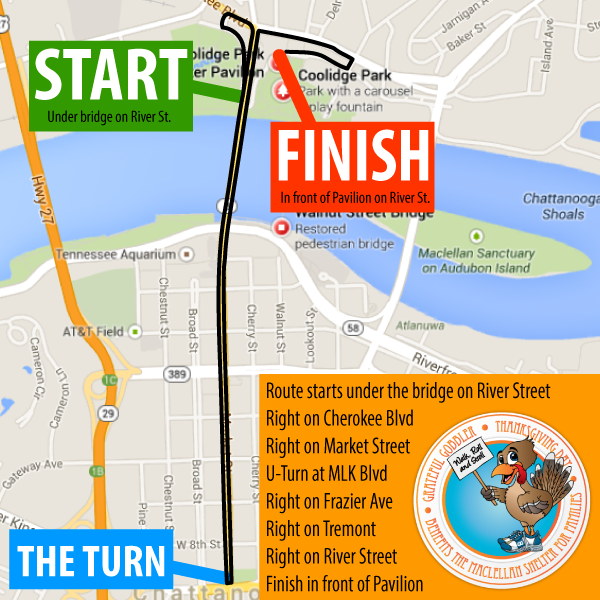 Walkers will gather at Coolidge Park for festivities before the 8:00 a.m. start. The event is especially exciting this year as 100% of the proceeds of the walk will benefit the Maclellan Shelter for Families, an emergency homeless shelter located on site at the Community Kitchen on 11th Street in Chattanooga. The Shelter features 13 units with 68 beds for families experiencing homelessness. The Shelter provides a stable environment for families to remain together as they search for permanent housing solutions. From now through the month of November, Grateful Gobbler volunteers will be present throughout the community seeking your support for the Shelter. Please consider taking a moment today to find a way you can be involved. 100% of all registration fees, sponsorships, and donations to the Grateful Gobbler will directly benefit homeless families, guaranteed! REGISTER ONLINE THROUGH THE EVENT! You can also register in person Thanksgiving morning from 6:30-8:00 am. Coolidge Park lies on the banks of the Tennessee River in downtown Chattanooga located at 150 River Street. Directions: Take I-24 to 27 N to the Manufacturers Rd. exit. Take a right off of the exit ramp and continue on Manufacturers Rd. until it intersects Cherokee Blvd. Take a right on Cherokee Blvd. and proceed for .5 mile to turn right onto Tremont St. The stage festivities and announcements start at 7:00 am and the walk will start promptly at 8:00 am. Runners will be released first and then walkers will start the route.